ARP Carb Stud Kit 1.25" Spacer, 5/16" x 3.200" O.A.L. ARP Carb Stud Kit 1-1/4" Spacer, 5/16" x 3.200" O.A.L. 1.25" Spacer, 5/16" x 3.200" O.A.L. ARP 200-2408 - Carb Stud Kit 1-1/4" Spacer, 5/16" x 3.200" O.A.L. ARP's Carburetor Stud Kits are the perfect way to make sure the carburetor stays sealed to the intake manifold. Offered in a variety of heights to accommodate most any combination of carb and spacer, these stud kits are available in 8740 chrome moly with a black oxide finish or polished stainless steel. Pro Series NASCAR type stud kits have one of the studs drilled to facilitate sealing the carburetor in the engine by race officials. All carb stud kits include a nut starter nose and hex nuts and washers. 400-2408 is rated 5.0 out of 5 by 1. 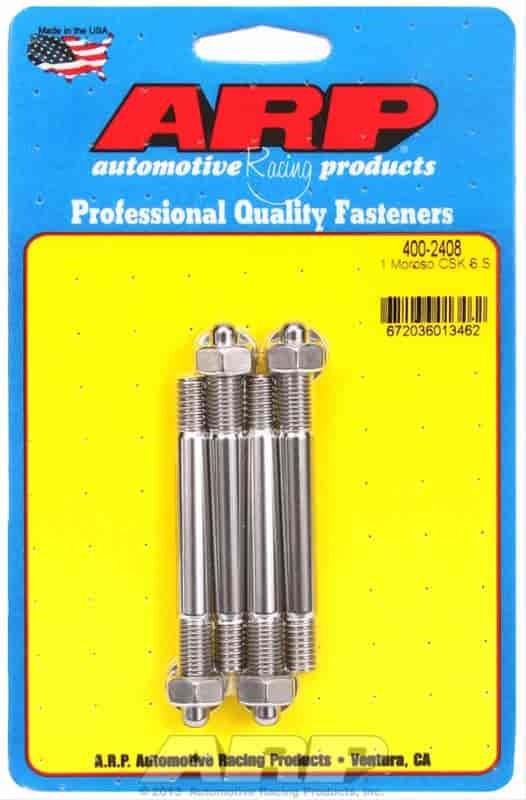 Rated 5 out of 5 by 66 Suburban from Nice As usual, ARP fasteners are the best! They always are!